Being pregnant for the first time is very exciting! The first trimester is a whirlwind of emotions and I know I couldn’t help but think of what it was going to be like when my family of two became a family of three. And when I first got into it, I thought I knew what to expect being pregnant. After all, I’ve been around plenty of pregnant women throughout my life and seen plenty of TV shows about it. 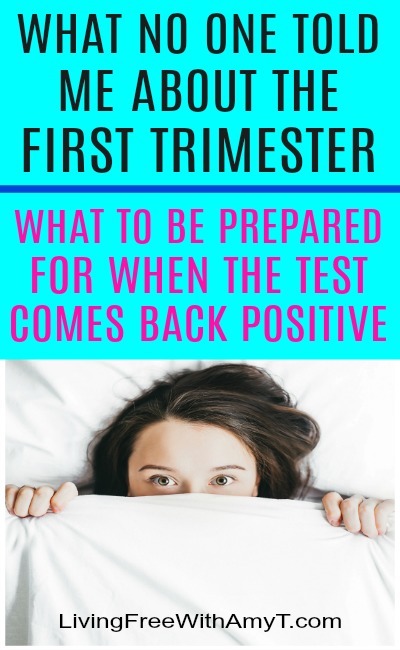 But what I have come to realize is that there are some of these symptoms of being pregnant I didn’t know about until I was actually experiencing it myself (especially when it came to the first trimester). I guess you can’t know everything and not everyone is going to talk about everything! This post was updated February 18th, 2019. I knew when you’re pregnant you have to pee often, but I thought this was the case mostly just in the third trimester. I had no idea it starts right away! Before I even knew I was pregnant I was waking up many times during the night to go. Looking back on it, this was one of the first signs of pregnancy for me. I just didn’t know it at the time! Unfortunately, this part of it did not subside and continued throughout the rest of my pregnancy. Getting up 4 or 5 times a night was a common routine. But I guess it was just practice for when my baby would actually be here waking me up multiple times during the night! If you are experiencing this, it is recommended to lean forward when you are going, which helps more urine escape your bladder. Beginning in the first trimester, I was short of breath a lot. When I finally saw the nurse at 8 weeks she said this is common. Again, I had no idea! I can understand if at the time I had been carrying a 6 pound baby, but this also began pretty early. Just walking into work would wear me out. So if you are in this situation right now, take it slow and sit down when you need to rest. People are usually very understanding when pregnant women need to take a few minutes to gather themselves. Take advantage of that! One of the first things you do when you have a positive pregnancy test is make a doctor appointment. But what surprised me is that my doctor didn’t even want me to come in until I was at least 8 weeks along. I always thought that as soon as the test came back positive, you went to the doctor to confirm the test and make sure everything looks OK. But it turns out that if it’s too early, the baby won’t even show up on an ultrasound yet and you can’t yet hear the heartbeat. Another thing that Hollywood has incorrectly taught us! Obviously I knew about morning sickness before I ever got pregnant. But what I didn’t know was just how long it would last at one time. I thought it was something that would suddenly come on and then you run to the bathroom and feel better a few minutes later. I didn’t realize you may never feel better. Once it came on for me, it lasted for about 3 days straight (with a few occasional other days mixed in). I wasn’t constantly vomiting, but I had to move slowly or I felt like I would. I had to sit down often and keep Saltines with me. I learned that ginger ale is a great help during this time as well so I always kept a bottle with me. Saltines and ginger ale are my top two recommendations to you if you have morning sickness. I also had to leave work early those days and just lay in bed. Hopefully you work somewhere you can call in sick if you need to. Because believe me, the drive to work did not help matters! If you do have to work while you are feeling this way, lay your head down on your desk for a few minutes if you can, sit down more often, and pray that your boss and co-workers will be understanding. All things considered, I had it pretty easy. I now know that many women are sick non-stop for months on end or even throughout their entire pregnancy. If you are one of these women, I feel for you! Morning sickness also does not just happen in the morning but can be all day and all night long. However, it is pretty common to wake up in the morning not feeling so good because you haven’t put any food in your stomach all night. Keep some crackers next to your bed to munch on before you ever get out of it in the morning to help. 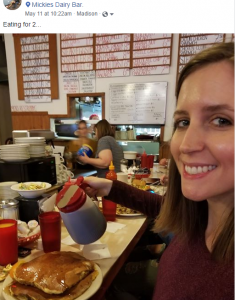 Even eating for 2…I couldn’t finish those pancakes! But really, eating for 2 is just an excuse to eat more, especially in the beginning. Our babies are so small that they really don’t need much more than what we are already putting into our bodies. In fact, it is not usually recommended to eat more calories than normal in the first trimester (unless you already happen to be relatively small). Our babies get enough nutrients already from us. So don’t think that as soon as that test comes back positive it’s an excuse to eat more and more of whatever you want. Eating a lot more just opens you up to more weight gain. It’s important to still take in a healthy amount of calories with a healthy diet. Click here for more information on this from Babycenter.com. Although bleeding during pregnancy increased for me in the second trimester, I did experience some of it in the first. Occasionally my gums bled just by brushing my teeth. This is caused by pregnancy gingivitis, due to hormonal changes that make the gums more sensitive to bacteria in plaque. So when you are pregnant and brushing your teeth, go slow and gentle but don’t worry too much if you bleed more than normal. My gums never bled for long. What was worse for me than my gums bleeding were nose bleeds. Usually I had one at least every other day. This happened because pregnancy makes the blood vessels in the nose expand and increased blood supply puts more pressure on the vessels causing them to rupture more easily. Not every pregnant woman experiences this (my pregnant sister-in-law at the same time did not have this issue), but many do. So just make sure to keep some tissues with you to be prepared! This and the next surprise hit me the hardest. At about 8 weeks pregnant, I had absolutely no idea that I would go from someone that was very motivated and always on the go ready to do something else, to someone that could barely get off the couch. For the past year, I woke up at 5am everyday to work on my blog and second job before I even went into my full time job for the day. All of a sudden I had to keep going back to bed after I had been up for a few minutes because I just couldn’t keep my eyes open. Nine hours of sleep a night was barely enough for me. Plus, it completely surprised me that I could barely make it past 9pm every night! Eventually, I had to quit waking up so early and sleep as long as I could in the morning. I also had to give up my second job. It was just too much for me at the time and I needed rest more than I needed the second job. If you are experiencing an increased amount of fatigue during the first trimester, give yourself a break and say no to some things once in awhile. Rest during pregnancy is very important. As I previously mentioned, this one also hit me pretty hard. I had been so motivated with my blog for the past year – waking up early to work on it and spending my entire weekends putting work into it – and all of a sudden that motivation was just gone. It was like it was never there to begin with. I would come home from work and all I wanted to do was just lay around and watch TV or do nothing. I didn’t have any motivation to grocery shop, cook dinner, clean – none of the things I used to do on a regular basis. The fatigue and unmotivation lasted for a little over a month and it seemed as though I was never going to feel better. I pictured myself raising my child and barely being able to summon up the energy and motivation to do anything with him. I wondered how other parents did it when I would see them out with their kids. Of course this is a ridiculous thing to think as I knew eventually my fatigue would go away and my motivation come back. But in the moment it seemed like it would never end. I also thought about current moms that were pregnant and trying to raise one or more kids while feeling this way. If this is you or has been you, kudos to you! You are my heroes! If you are in your first trimester right now and are experiencing fatigue and lack of motivation, have hope, because it does get better! The second trimester was a breeze for me. I became rather unmotivated again in the third but at least I wasn’t as tired as I thought I would be. I always tried to take advantage when I felt well to get as much done as I could. If you’re not feeling so good now and nothing is making you feel better, just remember, you are growing a human! It is OK to feel a little tired, down, and worn out. Give yourself a break. You deserve it! If you have been pregnant before, what surprises would you add to this list? Please share in the comments below! If you are preparing to breastfeed for the first time, I highly recommend taking Milkology. This class will teach you all the ins and outs of breastfeeding including why it is important, how to produce milk, and how to get the baby to latch. I highly recommend this course and that it is taken well before the baby arrives! You can read my review of the class here: The Ultimate Class To Make Breastfeeding A Success.